Disney Infinity is Dead. We Should Have Seen it Coming. Disney recently shut down Disney Infinity, its popular toys-to-life franchise, resulting in a $147m (£102m) write down or "Infinity Charge" for the media giant. Many were shocked and saddened by the loss of the game, which allowed players to buy action figures of Disney-owned characters such as Elsa, Thor, Buzz Lightyear and Luke Skywalker, place them on a special dock and transport them into the Disney Infinity video game. But a closer look at the product's performance suggests its demise was inevitable. The bad news seemed to come out of the blue. After the premiere of Star Wars: The Force Awakens in December, Disney Infinity was revealed to be the most popular toys-to-life franchise in terms of dollars spent. Moreover, Fortune spoke with a video game analyst who estimated Disney Infinity Star Wars toys and games racked up $200m in sales last winter. Nonetheless, it seems Disney has decided to focus its efforts elsewhere. Jimmy Pitaro, chairman of Disney's Consumer Products and Interactive Media, told Wired that, "The lack of growth in the toys-to-life market, coupled with high development costs, has created a challenging business model." Similarly, Disney chief Bob Iger told investors that although the first version of Disney infinity did "quite well" and was "extremely well received", while the second version "did okay", the company had doubts about the stability of the console games business, especially as a self-publisher. He also highlighted the substantial risks of manufacturing the toys and managing inventory, which "caught up" with them. Accordingly, Disney has decided to cease developing its own console games. It will now focus on mobile games - puzzle game Tsum Tsum has been a big hit - and licensing out its characters to video game companies such as EA, creator of Star Wars: Battlefront, which sold more than 14 million copies between its release in November and the end of March 2016. 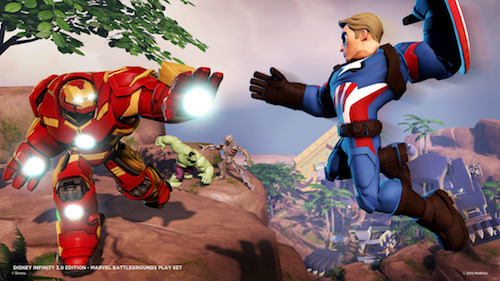 The short-lived success of Disney Infinity is evident in the media titan's earnings. In each of the four results statements that followed its launch in August 2013, the game was highlighted as a key growth driver for the interactive division. There was a slowdown in the subsequent quarter, reflecting the timing of Disney Infinity 2.0's release. 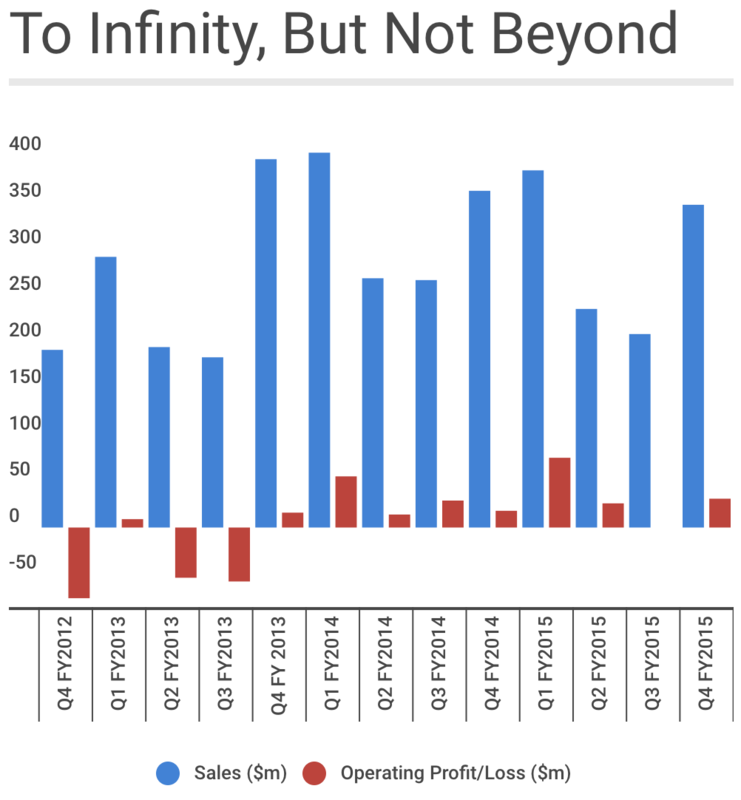 But for the next seven quarters after that, the division was held back by weakening Infinity sales. Given the game has underperformed for over two years, no wonder Disney has shut it down. Our chart shows quarterly sales and operating profits in Disney's interactive division for the three-year period to 03 October 2015. It excludes the first two quarters of this financial year as Disney now reports its interactive and consumer products businesses as a single division. The sharp rise in revenues and the swing to profitability following the game's release in September 2013 (Q4 FY2013) is evident. But it's also clear that revenue and profit growth quickly moderated after a strong first year. Disney may have felt the weight of inventory and marketing costs and realised it wouldn't be getting its investment back. In the weeks before Disney Infinity launched, insiders pegged the cost of developing the game and toys at north of $100m, according to The Wall Street Journal. Yet Disney's interactive division made a net operating profit of only $85m in the three years that followed. The Mouse House may have feared the situation would only worsen. If the roll out of Marvel and Star Wars characters in the past two years received a lukewarm reception, toys from Alice Through the Looking Glass and Finding Dory - still slated for release this year - don't inspire much confidence. Disney may also have grown weary of the toys-to-life market's dynamics. The BBC spoke to a video games analyst who said these types of games start off strongly but struggle to generate repeat sales. He suggested Disney may have baulked at the costs of keeping its game fresh and competitive. Pressure from rivals is certainly growing: Lego Dimensions was released in September 2015, Nintendo sold 25m Amiibo figures in the year to 31 March 2016, and Activision Blizzard, which kicked off the toys-to-life trend in 2011 with Skylanders: Spyro's Adventure, plans to release its sixth Skylanders game this year. Many will bemoan the loss of an innovative game that featured a rich cast of characters. But its time had clearly come.